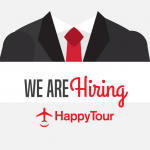 Happy Tour is looking for a Reservation Sales Support – Asociated Agencies and Resellers. Taking requests from partner agencies and preparing bids for them. Provides support to partner agencies accessing Happy Tour booking systems. Ensure the reservation / sale of domestic and foreign tourist services. Keeping and developing the relationship with Happy Tour partner agencies. Drawing up tax and travel documents. Ensure contact with all service providers. Medium / higher studies; it may be an advantage to graduate a „Travel Agent” course. It is an advantage to knowing the systems: Toma, Bistroportal, TINA, TBS, Cruises.